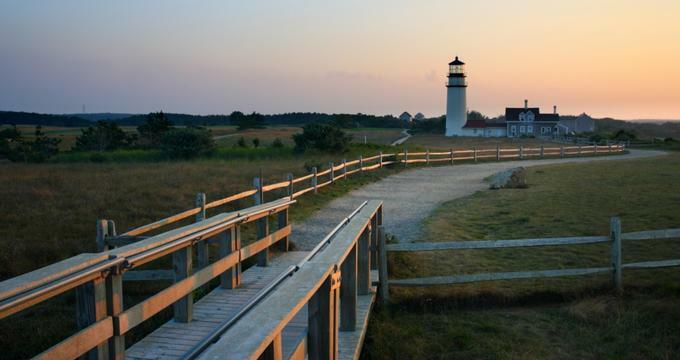 The national seashore located at Cape Cod/Wellfleet in MA is the perfect getaway for visitors to both learn about the local environment and wildlife while also having a great time. Walk or hike along the beach, take a hike, paddle a canoe… the options are endless. Officially created by John F Kennedy in the early 1960s although extending much further back (even Thoreau visited in the 1800s), the seashore consists of over 45,000 acres of ponds, beaches, woods, and much more natural environmental beauty. Oversand Beach Drives - Comprised of many miles of beaches specifically managed by the Massachusetts National Parks Service for off road vehicles (also known as ORVs), the oversand beach driving section of the national seashore is perfect for those adventurous drivers with their ORV permit. All drivers must follow both state and federal ORV driving regulations and stay only in the designated areas (a map is available on the website for reference). There is also information on how to obtain a permit before a visit, if desired. All permitting will be strictly enforced. Ranger Tours - There are a variety of ranger guided activities offered at the seashore as well. Take a stroll or try a more advanced hike, go on a canoe trip, tour some of the historic buildings or just talk with rangers about the local environment, history, wildlife and more. Although many of the tours are offered free of charge, a few (the canoe trip, for example) do require an additional fee. Contact the park ahead of time to reserve. Keep in mind that groups of larger than 8 are not allowed to join regular tours and must instead schedule a private group ahead of time. Stop by either visitor center (Salt Ponds or Province Lands) for additional information, as not every program is available all the time. There also may be other activities available as well. Fishing and Hunting - Visitors to the seashore can fish in designated areas as long as they possess a valid and up to date fishing license. Additional information about that license, as well as how to obtain one, is available on the website. Hunting is also permitted as long as visitors follow applicable Massachusetts state regulations. Migratory waterfowl, upland game (grouse, quail, pheasant, rabbit, fox, raccoon, etc.) and deer are all allowed but visitors should make sure to verify season on the website. All safety guidelines must be followed and are the visitor’s responsibility to know. Hunting is not allowed from the 1st of March to the 31st of August. Dogs are permitted in certain circumstances as well. Trapping of wildlife is not permitted. Field trips to the seashore are a great opportunity to provide students out of classroom hands-on learning experiences. Open all year for self-guided field trips and at certain times of the school year for ranger-guided field trips, there are options for every classroom to fit their needs. There are many only materials available on the official website to provide teachers with the ability to create an advance learning plan around what students may see while at the shore. Be aware that no digging or collecting is allowed without a research permit (contact the natural resource division). All student groups must stay on marked and designated trails to avoid damaging the environment. Bathrooms are available, but they are not open all year so teachers should verify prior to the field trip. There are no indoor facilities so, in the event of inclement weather, teachers should have a secondary plan in place. There are events offered all year round at the seashore. The website is maintained and updated frequently with the wide variety of both fun and educational opportunities, so visitors should make sure to check prior to a visit to see what they offerings may be. In the colder months, the seashore offers indoor learning opportunities in the visitor centers for people still wanting to experience the seashore. Events like public artist receptions and learning tables, as well as occasional outdoor activities like the pre-Thanksgiving cranberry bog walk keep people engaged all year round. The warmer months bring a plethora of outdoor learning experiences like guided walks specific to different areas of the park. Visitors can also rent one of the many cottages available on and near the seashore, with 100% of all proceeds going back into the maintenance of the shore. Contact the leasing office for additional information, cost, and availability.